The definition of a personal injury case is a legal right or civil action where a plaintiff (injured party) who has suffered loss as a result of a wrongful or unlawful act of the defendant should at least be put back in the same position he/she was prior to the act; and that damages are the proximate result of the wrongful act or conduct. A personal injury case falls under Tort law. Torts are civil wrongs recognized under the law for wrongs resulting in injury or harm constituting a basis for a claim by the injured party by awarding damages to that party. Most people are familiar with negligence torts such as an automobile accident and slip and fall cases due to the wrongful act of the defendant. However, there are also intentional torts (ie., intentionally hitting a person) and strict liability torts (ie., dog bite cases). Three main elements to establish a personal injury case are: (1) liability (2) damages (3) collectability. Negligence: The definition of negligence is a failure to behave with a level of care that someone with ordinary prudence would have exercised under the same circumstances. The behavior usually consists of actions, but can also consist of omissions where there is some duty to act. The main factors to consider in determining whether a person’s conduct lacks reasonable care are the foreseeable likelihood that the person’s conduct would result in harm, or reduce the risk of harm. The five elements required to establish the basis of negligence are: the existence of legal duty to exercise reasonable care; a failure to exercise reasonable care; cause in fact of physical harm by the negligent conduct; physical harm in the form of actual damages; and proximate cause showing that the harm was in the scope of liability. Typical negligence action include motor vehicle accidents, airplane/aviation accidents, premise liability, construction accidents, medical malpractice claims, motorcycle accidents, spinal cord injuries, and brain injury claims. Motor vehicle accidents: These type of accidents involve automobile accidents, pedestrian accidents, motorcycle accidents, bus accidents, bicycle accidents, truck and tractor/trailer accidents, vehicle turn-over, defective vehicle accidents, negligent road maintenance and design, and wrongful death. 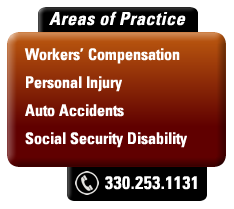 Premise liability accidents: Property owners are responsible for certain injuries sustained by people on their property. Premise liability involves legal matters which occur when a property owner does not maintain the property. So called trip and fall or slip and fall are the best known examples of a premise liability case. Slip and fall accidents can include any kind of accident in or on the owner’s home, property or place of business where there is a duty to act with ordinary care to ensure the safety of those on the premises. Types of premise accidents include, slip and fall, unsafe conditions, elevator accidents, retail, store, restaurant negligence, sidewalk falls, road design accidents, and falling object accidents. Over recent years in Ohio, the law has been leaning more favorably to the owner or occupier of the premise. Common legal issues involve notice to the owner of a hidden or latent defect or dangerous condition, open and obvious hazards, legal classification of the injured person, natural accumulation of snow and/or ice, and precipitation track-in cases (ie., slippery conditions which develop due to precipitation tracked into a store by customers). Under the law, landlords have certain legal responsibilities to the tenants. If a landlord breaches its duty to the tenant causing injury to the tenant or its guest, there may be a basis for a personal injury case. If the injury occurred at a private residence, there may be homeowners insurance to cover injuries and damages. Most business establishments carry commercial liability policies. Medical malpractice, often referred to as medical negligence, occurs when a healthcare provider breaches the standard of care when providing treatment or diagnostic testing to a patient, causing that patient to suffer an injury or death. Medical malpractice can result from the substandard care provided by the medical practitioner or by the failure to take medically appropriate action. It is important to remember malpractice means “bad practice” and not bad results. If a physician, hospital or healthcare provider follows the appropriate standard of care exercised under like and similar circumstances based upon the skill and knowledge of that healthcare provider, then the injured party is unlikely to recover from that healthcare provider even if there are terrible consequences. Common examples of medical malpractice include failure to provide appropriate treatment for a medical condition, misdiagnosis of or failure to diagnose a disease or medical condition, or unreasonable delay in treating the diagnosed medical condition. Common malpractice cases include misdiagnosis of cancer or other serious condition, surgical mistakes and preventable birth injuries. Due to the complexities and significant litigation expenses, changes in the law over recent years which are more favorable to healthcare providers, and the aggressive defenses of these types of cases by the healthcare provider attorneys, medical malpractice cases should only be considered where there are serious injuries/damages or there is death. Stories fed to the media, particularly by insurance companies, give the public a false impression that there are too many frivolous medical malpractice lawsuits driving up healthcare costs, burdening doctors with much higher insurance premiums, and driving doctors out of medical practice. However, true independent studies show that this is not the case. There are statutes and Court rules that make it virtually impossible to file a “frivolous” medical malpractice lawsuit. In fact, a medical malpractice case cannot even be filed in Ohio until a retained qualified medical expert has sworn that there was a breach of the recognized standard of care which led to the patient’s injuries, damages or death. The main reason for increased insurance premium costs is due to investment losses by the insurance companies. In response to the exaggerated claims of insurance companies and their pressures exerted on healthcare providers, the Ohio Legislature has placed a number of restrictions on medical malpractice cases including limits on non-economic damages (ie., pain and suffering). There is also a very specific Statue of Limitations for filing of medical malpractice lawsuit. Generally, the plaintiff must file a lawsuit within one (1) year of the act or omission giving rise to the injury or provide written notice to each defendant within one (1) year of the act or omission giving rise to the injury. A lawsuit may be filed 180 days after notice is given and service of the notice tolls the Statute of Limitations by 180 days. Medical malpractice actions based upon the presence of a foreign object inside the body must be filed within one (1) year the object is, or should have been discovered, and may not be filed more than four (4) years after the act resulting in the presence of a foreign objects regardless when the object is discovered. In cases of minors (those under 18 years of age), a claim must be commenced within four (4) years of the act underlying the injury. Strict liability, also sometimes referred to as absolute liability, arises when the defendant is responsible for injury and damages even if the defendant was not at fault or negligent. Strict liability is usually imposed by the Courts of Legislature for reasons of public policy because certain activities are so hazardous that the person or entity carrying out the activities is willing to insure others against the harm which results from such hazardous risk. Common strict liability cases include product liability cases, dog bite cases, keepers of “wild” animals which cause injury, or those storing flammable liquids, blasting, accumulating sewage or emitting toxic fumes. Employers are also absolutely liable for the wrong doing of their employees which leads to injuries of others under a legal doctrine known as vicarious liability. Thus, if your automobile was negligently struck by an 18 wheeler, that truck driver’s employer is also liable for the damages directly caused by the driver’s negligent acts. Product liability refers to Ohio law which holds a manufacturer or seller liable for placing a defective product into the hand of a consumer directly causing injury or death to that consumer. Generally, the law requires that the product meet the ordinary expectations of the consumer and when the defective or dangerous product is unreasonably dangerous, then liability for injuries and damages can result in a lawsuit. In product liability cases due to strict liability, the injured party does not need to prove that the manufacture was negligent, but only that the product was defective and proximately caused the injured party’s injuries/damages. These type of cases involve product defects, design defects, manufacturing defects, marketing defects, and unavoidably unsafe products. The product must not only be proven to be defective which led to the injury, but that the defect made the product unreasonably dangerous. There can also be a negligence action maintained against a manufacturer in certain cases (ie., negligent design defect claims). Defective medications, improperly labeled products or failure to warn of product hidden dangers can result in a product liability case. Today, there are a number of manufacturing defect cases against pharmaceutical companies where that companies’ drugs have directly led to serious injuries, serious medical conditions or even death. Recent lawsuits have involved such medications as Vioxx, Fosamax, Paxil, Prempro, Avandia and Digtek. Product liability cases are extremely complex, financially expensive to pursue and have been greatly affected by changes in recent years under Ohio law which tend to favor the manufacturer. Due to these factors, the injuries must be serious and the damages significant to make the pursuit of such a lawsuit feasible under the circumstances. Under the old court made legal doctrine, “every dog was entitled to one good bite.” This means that the owner of the dog had to have prior knowledge of the dog’s vicious propensities in order to hold that owner liable for injuries or damages. A number of years ago, the Ohio Legislature brought dog bite cases under a strict liability standard. Under the Ohio liability statute, the owner or keeper of a dog is strictly liable for damages for any injury, death, or personal loss caused by the dog unless at the time of the injury the victim was committing or attempting to commit a trespass or other criminal offense on the property of the owner or keeper, or unless the injured person was committing or attempting to commit a criminal offense against any person, or was teasing, tormenting or abusing the dog on the owner’s or keeper’s property. The definition of an intentional tort is different than the definitions of negligence and strict liability. In a negligence action, the defendant has a duty of care owed to a person, breaches that duty of care which directly causes injuries or damages to the plaintiff. In strict liability law, the defendant is liable for injury and damages regardless of the precautions or actions taken by the defendant. Generally speaking, an intentional tort requires proof that the defendant acted with the specific intent or possessed a mental state of intentionally performing the act which was the proximate cause of the plaintiff’s injuries. The defendant must be shown to have performed the action leading to the plaintiff’s damages, and that the defendant acted with purpose or that he had knowledge with substantial certainty that the act would result in such injury or damages. Some intentional torts not only result in a civil action against the defendant but also may result in criminal action such as for assault and/or battery. Other common intentional torts include conversion (taking property out of possession of another with intent of exercising a permanent or temporary dominion over it despite the owner’s entitlement to use it), false imprisonment (where a person is illegally confined by a private person/entity or governmental entity), false arrest, fraud, defamation (libel and slander) and invasion of privacy. Not only can the victim of an intentional tort receive compensatory damages (ie., medical expenses, pain and suffering and lost wages, etc. ), but can also pursue punitive damages to punish the defendant for misconduct and to discourage others from committing the same offense. Under recent statutory changes, the Ohio Legislature has placed “caps” on punitive damages. Although the Ohio Constitution grants employers immunity from ordinary negligence actions brought by the employee, the Ohio Supreme Court, beginning in 1982, held that the employer could be held liable in damages under common law for intentional tort committed against the employee. Employment intentional tort is a civil claim for damages brought by an employee who is injured in the course of employment where the employer either: (1) deliberately intends to cause the injury, or (2) acted with a substantial certainty that such injury to the employee would occur. The test of “substantial certainty” is: (a) knowledge by the employer of the existence of a dangerous process, procedure, instrumentality or condition within the business operation (b) knowledge by the employer that employees are required by virtue of their environment to be subjected to such dangerous process, procedure, instrumentality or condition that harm would be substantial certainty, and not just a high risk; (c) the employer, under such circumstances and with such knowledge, did act to do so required the employee to continue to perform the employment task. A typical intentional tort case against an employer might include knowledge of persistent toxic fumes, chemicals or dust which knowingly make the employees seriously ill; removal or modification of a safety device which is substantially certain to lead to an employee’s injury; or, an intentional wrongful delay or termination of Workers’ Compensation payments by a self-insured employer which causes serious financial hardship to the employee. A self-insured employer has not committed an intentional tort simply by exercising its legal right to contest or appeal issues involving compensation payments. In response to the protests and concerns of Ohio employers, the Legislature passed three different Intentional Tort Statutes which were declared unconstitutional by the Ohio Supreme Court. The Ohio Legislature passed a fourth statute to limit the intentional tort law. The constitutionality of this new statute was upheld by the Ohio Supreme Court in 2010. Under the new statute, an employee is still entitled to present a claim for intentional tort against an employer over and above that employee’s Workers’ Compensation recovery. However, the new statute states that the injured worker must establish that the employer either (1) intended to injure the employee, or (2) acted with the belief that the injury to the employee was substantially certain to occur. However, the term “substantial certainty” has been limited to when that employer acts with deliberate intent to cause an employee to suffer an injury, disease, or condition of death. This is a much higher standard of proof for the injured worker. Since the new statute raises so many legal questions, Ohio Courts have been struggling with definitions and requirements of this statute. However, it is still in the injured employees’ interest to consult with an experienced Ohio Workers’ Compensation-Personal Injury attorney in exploring the possibility of filing an intentional tort action against the employer. From a practical standpoint, the injury should be serious and damages significant to make it economically feasible to pursue such a lawsuit.